BENGALURU (March 15): Southeast Asian stock markets were tepid on Wednesday, as investors wait to see what cues the U.S. Federal Reserve would reveal on its monetary policy outlook. The Fed began its two-day policy meeting on Tuesday. With the futures market pricing in more than a 90% chance that it would raise interest rates, investors' main focus turned to what its statement would say about the pace of hikes this year. The Fed will announce its decision at 2 p.m. in Washington, followed by Chair Janet Yellen's news conference half an hour later. Though recent data, particularly out of China, has fuelled a rally in Asian equities since the start of the year, investors are expecting more headwinds for emerging markets due to an increasingly hawkish Fed. MSCI's broadest index of Asia-Pacific shares outside Japan was flat, after posting its second-biggest daily gain this year in the previous session. Investors are just waiting for the final outcome of the Fed meeting, said Joseph Roxas, president of Manila-based Eagle Equities Inc, adding that regional central banks might change policy rates based on the Fed decision to protect their respective currencies. Meanwhile, the Indonesian central bank is expected to keep its benchmark rate unchanged, even if the Fed raises rates, a Reuters poll shows. Indonesian shares were marginally higher with retailer Indoritel Makmur Internasional rising as much as 25%. An index of 45 most liquid stocks was down 0.06%, with mining contractor United Tractors shedding 2%. Indonesia's exports and imports expanded at a slower pace in February compared with a month earlier, as expected in a Reuters poll, data from the statistics bureau showed. Singapore shares were almost flat after shedding nearly 1% earlier. Industrial stocks Jardine Matheson and Singapore Technologies Engineering fell more than 0.8% each. Data released earlier showed that the city-state's unemployment rate grew 2.2% in the fourth quarter, in line with estimates. Fourth-quarter job redundancies, however, increased 33% over the previous quarter. 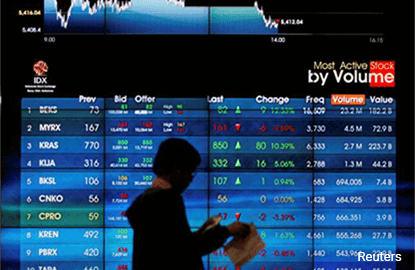 Malaysian stocks were down after three sessions of gains, with consumer and financial stocks leading the decline. IOI Corp fell 1.3%, while Malayan Banking dropped 1.2%.